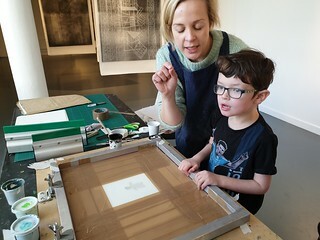 WE SPENT 90 minutes with creative artist Aoife Barrett in the South Tipperary Arts Centre and produce 18 pieces of print work using tools and techniques Aoife demonstrated to Dylan (7) and Mia (11). Then the young artists shared their work on Flickr. Aoife is the current Artist in Residence at the South Tipperary Arts Centre, 11 Nelson Street, Clonmel. Through the middle of February 2019, her exhibition “Shambles” hangs in the ground floor. During the first weekend of the exhibition, Aoife is conducting workshops for anyone who drops in. The results--and the hands-on creative process--is mesmerizing and delightful. Behind Aoife Barrett in the series of photos I snapped is "Shambles", her exhibition of recent and current work. Aoife's screens explore "a never-ending urge to create order and routine in our daily lives". The exhibition hangs until the middle of February 2019. Aoife is the first graduate from the Limerick School of Art and Design that I have consulted to see if there is a natural flow between the traditional realm of art and the digital realm of creative media. I hope that we can collaborate and link other entities such as Wom@rts at Limerick Printmakers, The Control Room in Bristol, Robert Blackburn's Printmaking Workshop, the Dartmoors Arts Project in Devon, and Artsource in Australia.